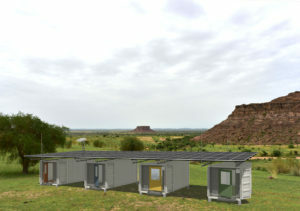 We can do much, much better in the design of our buildings . . .
We learn things every day in the practice of architecture. On these pages we share new developments, discoveries pro and con about established ideas, whatever we think might interest you . I started my career building a playground in a poor neighborhood in Troy, N.Y., after my senior year at Rensselaer Polytechnic Institute. As I watched local kids enact pop-star performances on a pyramidal platform at one end of the big sand box, I realized that the creation of formal objects is just a beginning. 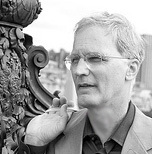 They leave our hands and are inhabited by their users in ways we cannot possibly imagine. Design should always start with big ideas, but, paradoxically, good big ideas can only occur in the synthesis of thousands of small details. That’s why you are going to see on this site a focus on very specific, material things, and only occasionally the philosophic comment. And like the kids on the playground, I’m hoping our readers will surprise and amaze us with their comments. 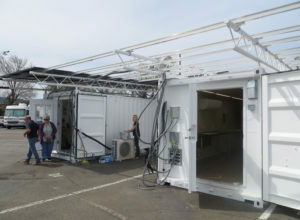 Capping over a year of work, four all-weather rooms built into shipping containers have been assembled, tested, packed and placed on a ship in Oakland bound for Kellé, Niger. 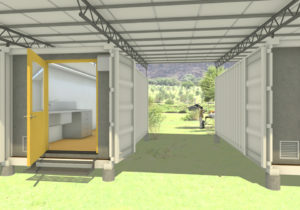 Pete Retondo Architecture donated the design and documentation, totaling 14 sheets of detailed drawings, and helped with commissioning, testing and modification prior to shipping. 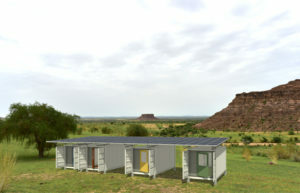 The design started out as just two rooms, but it was designed for “extensibility,” and before we were done it had already expanded to four with 108 solar panels rack-mounted on a canopy that shades the rooms and keeps them up out of harm’s way. 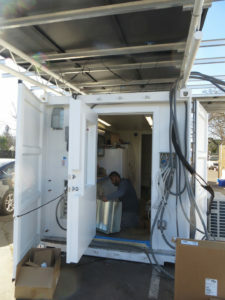 One entire container is devoted to the photovoltaic system equipment (partially donated by Outback Systems), including about 17,000 pounds of closed cell batteries. Each cell is 2 volts and weighs about 350 pounds. Eight inverters convert the DC power stored in the batteries to AC power, which is used to run the facility. 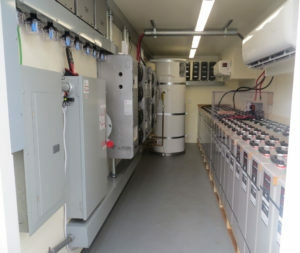 A large chunk of power goes to the mini-split air conditioning system (donated by Lennox), which consists of four outdoor heat pumps that can supply chilled or heated refrigerant to fancoil units inside each room. You can see these units in some of the photos below. This system was designed to maintain indoor temperatures around 80 degrees F, even when the temperature outside gets up to 130 degrees. 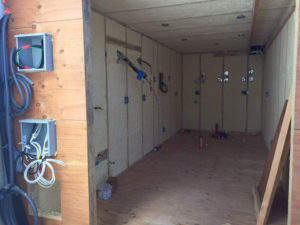 That was necessary so that the equipment, which maintains critical temperatures for incubating and hatching the eggs, can operate as it is supposed to. 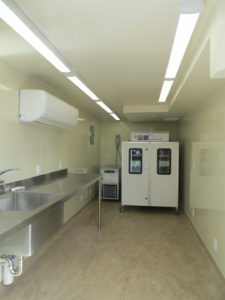 The hatcher and incubator equipment is designed for commercial poultry operations. The naturalists hope that with this special care in clean, controlled rooms, 95% of the eggs will hatch successfully. 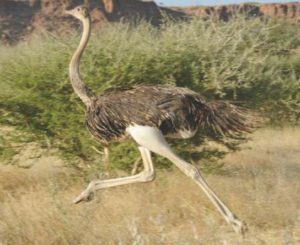 With clutches of 8 or more eggs, 5 breeding pair in Kellé and 2 breeding seasons a year, it might be possible to produce 75 chicks a year just to start, with an eye to reintroducing this species in the wild. 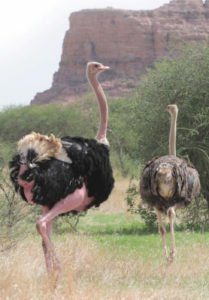 (To learn more about the “red necked” or North African Ostrich, see this page on the Sahara Conservation Fund website.) 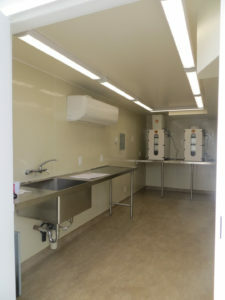 Eggs will spend 41 days in the incubator (pictured left), which maintains them at 97.5 degrees F while periodically turning them. 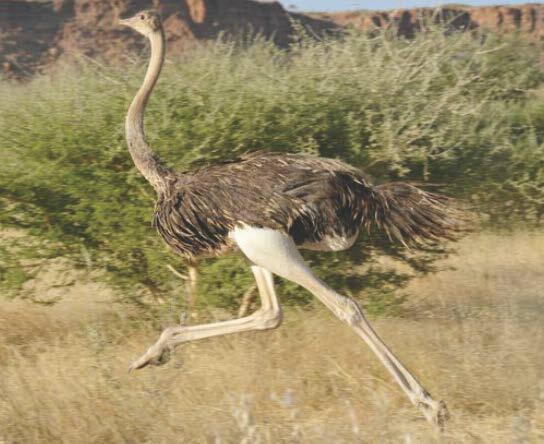 The NatureForm 1080 incubator can accommodate 90 ostrich eggs, each weighing 3 to 4 pounds. After several days in the hatcher, they will be introduced into the natural environment and raised by the staff in Kellé. A thorough program to test and mount every component of the systems was carried out on an RV storage lot in Novato, California, prior to shipping. The operation was covered extensively by local news, including this segment from ABC News in San Francisco. 15% of the eventual solar electric system was installed, and once it was running everything was powered by the sun. All the solar canopy truss system components were assembled to be sure it all fit together, then disassembled and packed into a container. 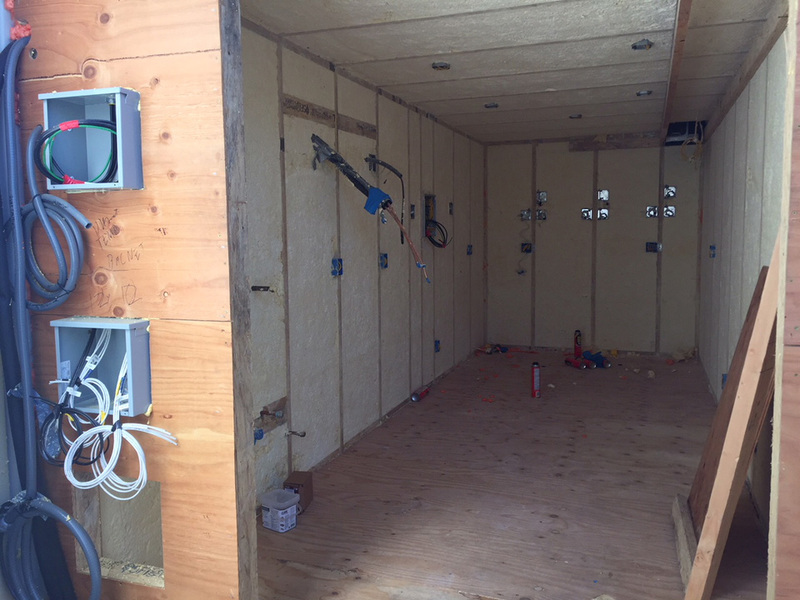 The satellite internet and communications uplink was installed and all the data systems, including a sophisticated monitoring system partially donated by C&C Building Automation and implemented by Steve Attell, a retired Stanford University architect of many talents, was successfully tested. 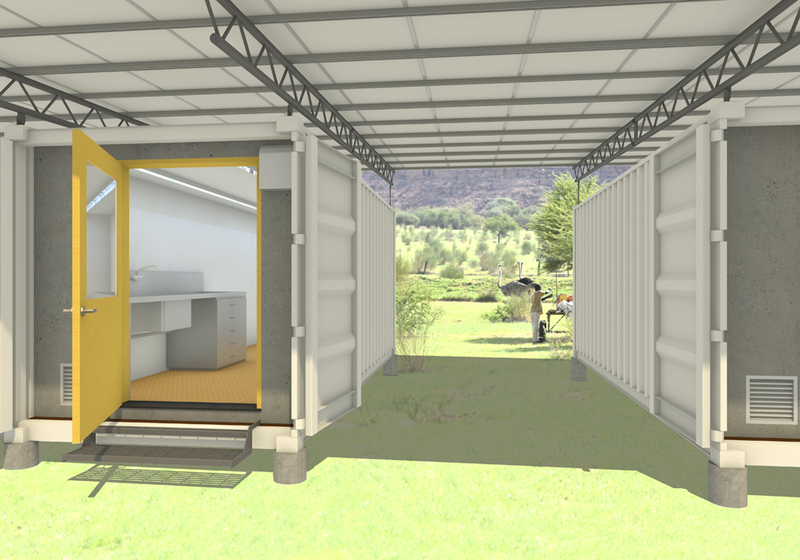 We will be able to post to the internet and follow all the temperature, humidity and power consumption data over time to help manage the project and develop a post-occupancy evaluation report. 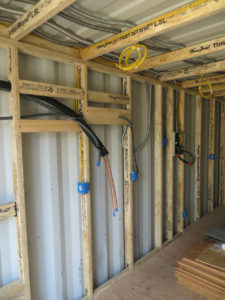 Many people lent their skills and sweat to this project, most notably Stephen Gold, solar project manager for the Wildlife Conservation Fund and the originator of the whole effort, Peter Amick (construction manager), and Henry Cundhill, assistant project manager. Anyone reading this can help by donating to the project – even though it is complete and has been shipped, loans were required to finish it and more work has yet to be done, including offloading and assembly in Niger. Please visit the WCN solar project page, watch the short video in progress on this amazing project, and make a contribution by clicking on the “support this project” button! It’s pretty rare to pioneer the use of something, and have it actually work. This is one of those stories, attested to by the first-hand experience of two inveterate bird lovers and technophiles with impeccable credentials. 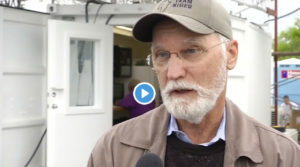 Three years ago we completed a project on their Petaluma farm property that included the first West Coast application of Ornilux “Mikado” anti-bird strike glazing – here’s why that is significant.